The $132K sale of a Babe Ruth Goudey card in October 2018 solidified the notion that autographed iconic baseball cards continues to be one of the hottest collecting angles in our illustrious hobby. Indeed, scripted issues of Ruth, Gehrig, Cobb, Mantle, Robinson, and DiMaggio, just to mention a few hallowed Hall of Famers who are highly coveted by advanced hobbyists. Unfortunately, the "pop" chart clearly indicates that these autographed keepsakes are few and far between. 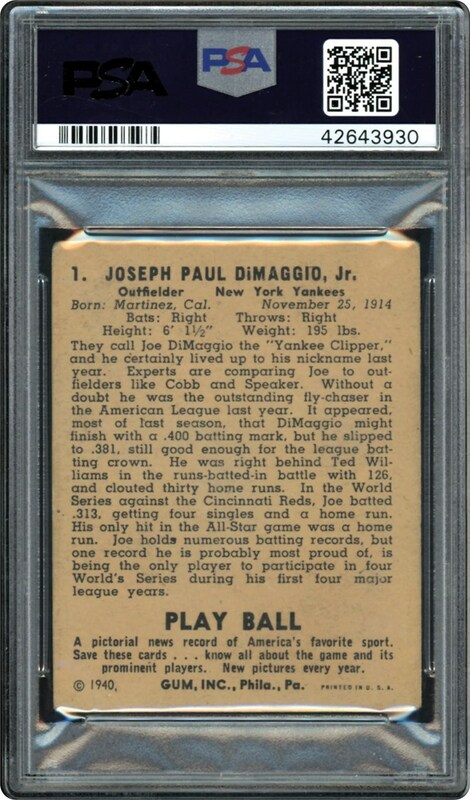 As a bona-fide testament to that notion, this magnificent 1940 Play Ball signed DiMaggio subject just happens to be one of only six examples listed on the prestigious PSA/DNA population report. 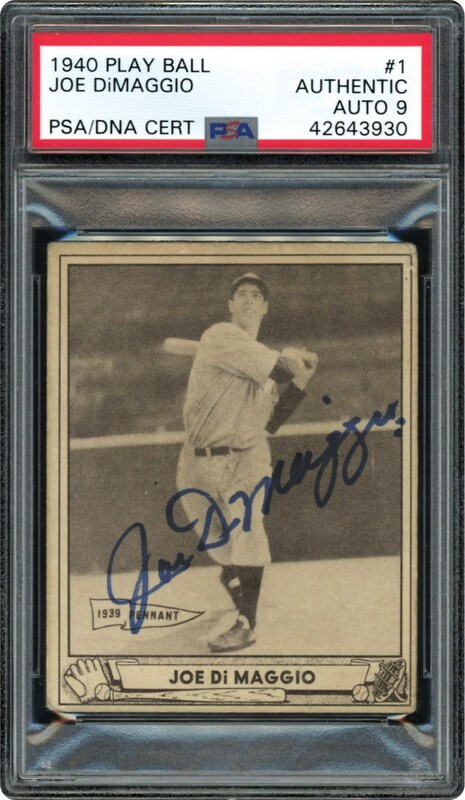 Imagine, PSA has handled over 450 1940 Play Ball Joe DiMaggio #1 subjects with only 6 of them signed by the immortal Yankee Clipper! The bold blue sharpie signature situated across "Joltin Joe's" classic Yankee pantaloons has been conservatively graded a PSA "Mint 9", with its breathtaking aesthetics arguably meriting the seldom issued "Gem Mint 10" assessment. Just as critical is the fact that the card itself portrays fine aesthetics with the renowned George Burke "Joe D" batting image retaining a majority of its original appeal. The embodiment of a National hero, DiMaggio stands as one of the most celebrated athletes in American history, with the rare combination of his unparalleled baseball prowess and legendary marriage to the blonde bombshell Marilyn Monroe solidifying his place as a true American icon. Only one year after this highly popular card was issued, "Joltin Joe" would embark on his unfathomable 56-game hitting streak, turning the baseball world upside down via this incomparable feat. We cannot imagine a finer testament to "Joe D's" remarkable legacy than this ultra-scarce scripted memento that turns back the clock to an era when he ruled Yankee Stadium's centerfield as well as the entire baseball community!